Parresia Blog | On Breathing Possible Futures. 11 Feb On Breathing Possible Futures. 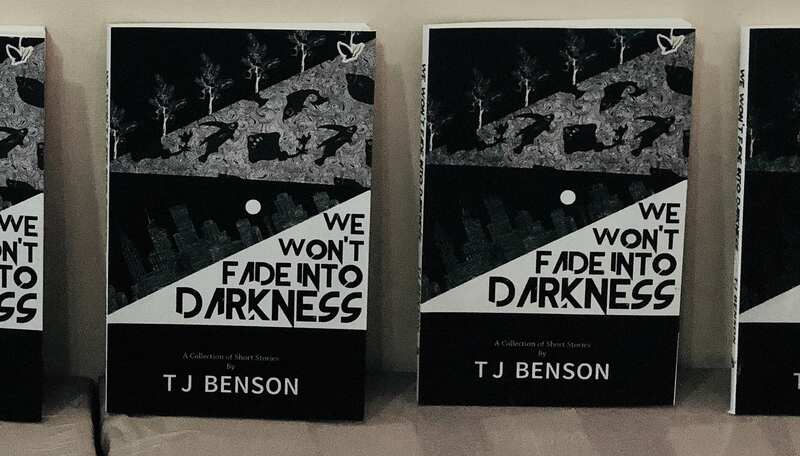 Book: We Won’t Fade Into Darkness| Fiction| Pages:135| Year: 2018.| Parrésia publishers| Author: TJ Benson. At the core of this collection and in the very material of its making is an avid engagement with the future. Its possibilities, plausibilities, warped juxtaposition with the past, implication of the present and of what might come to be of our imminent existences. There is an immediacy to the way this theme is explored such that the future isn’t a far, somewhat foggy idea. Instead one is shown that it is literally in our breathes, in the texture of the air, grazing our necks. With stories that lend weight to each other with masterful subtility and sometimes without, they at once stand wholly apart, just as they serve as relative complements. We Won’t Fade Into Darkness is a network of thirteen stories formed off people yet in a way that doesn’t seem so. From the very first story “Pretty Bird”, where two new lovers try to find a way to define the new existence they cannot even completely understand how they’d come to be in, to “Passion Fruit” where the son of a colonial master in a Nigeria that the British hasn’t left, finds himself defying his father the closer he gets to the idea of humanity, first through a slave he falls in love with and another he finds friendship with. The characters in these stories are firmly dynamic and display in full measure, the nature of the transience of human character, as well as the knack for survival and adaptability; literally and literarily. This is the base of the story “Nana”, which is of a reverse civilisation of sorts, trailing the bond humans, animals and nature can come to share. And as is the very nature of stories, this collection is staunchly political; laid out either in the form of extreme gender dominance in “Jidenna” that urges the mind to seriously consider the subjugation of women across different pockets of our existence today, against the backdrop of the often fractured relationships between fathers and sons and the many things hidden, repressed, or let out almost too late, to the recurring mention of Nigerium, a gaseous element that intoxicates the air and inflicts mindless harm to the body due to the indiscriminate exploitation of oil and functions actively as a corrective tool and or nemesis. There is something wrong with the world and the root of this isn’t behind the knowledge of the world itself. We Won’t Fade Into Darkness, while brimming with hope and the suggestion of safe escapes in the structures of hastily bred affections that are just as wonky as they are unstable, puts forth a lot to consider, not individualistically as the stories are unexpectedly delible, but as a whole, an urgent body of work anchored ashore by a sure, deceptive voice that beautifully marries a classical sense of patriotism with luminous, mostly arresting prose. Yet this collection also grows out to be a pop up shop for ideas that relocate steadily from one story to another thereby lumping them down a bit, perhaps because they aren’t always innovatively suggested to us but rather, made brashly known even when they don’t seem to matter as much as the other parts of the story one is engaged with. We Won’t Fade Into Darkness is an utterly delectable serving in and of the varied leanings towards imperfection and like all great works of fiction, urges the reader to consider, to weigh up possible futures, with the past and present in stride.